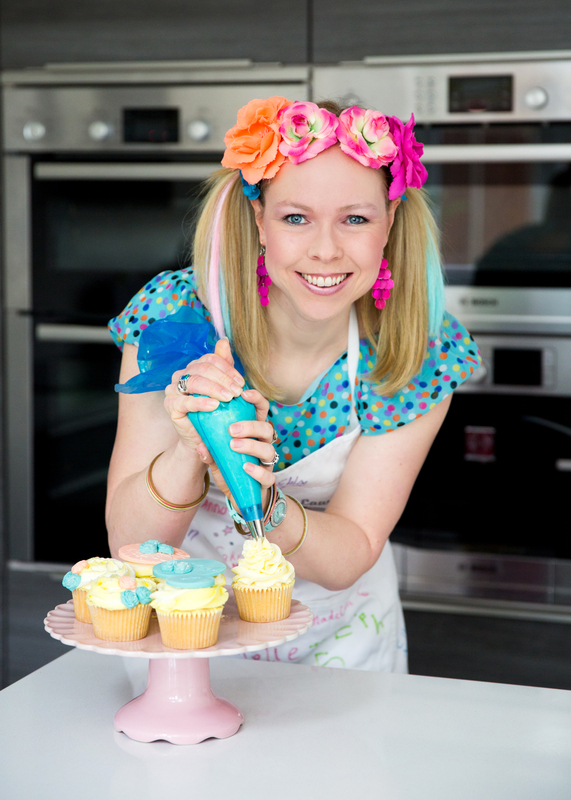 Introducing Betsy Buttercream, Katie Cupcake, Rosie Swirl and the Cake Stories Team!! Why not have a Cake Stories Cupcake Party! Suitable for children aged 5 and above, we will deliver lots of creative cupcake fun with yummy results! Each child decorates their own quality chef’s white apron, chef’s hat and 4 freshly made vanilla sponge cupcakes straight from the Cake Stories kitchen. They choose the colours for their buttercream icing and their fondant decorations. Lots of stirring, rolling, cutting and piping!! They will make their own cupcake decorations and pipe their icing onto their cupcakes. The Birthday child will receive a special cupcake rosette and they will award a rosette to the winner of best cupcakes! No need for Party bags..we’ve got it covered! At the end of the session, each child will receive a big bag full of their accomplishments! Their 4 decorated cupcakes presented in a professional box, their apron, chef’s hat and a special certificate. If you are thinking of having a cupcake party, please get in touch to discuss. Bookings taken well in advance. Cake Stories Cupcake Conga ! The parties are flexible, they can be set up in a local hall or in your home! £21 per child with a minimum of 8 children. We are based in Hemel Hempstead but can cover other areas where a reasonable travel charge applies. So sweet…. beautiful blog, good luck with your activity!!! Lauren – What fun !!!! Nice blog, congratulations for your work!!! Hi! Thank you very much. I can deliver to Epsom but would have to make a delivery charge as its about an hour from the Cake Stories kitchen. I can also deliver into Central London which some find convenient if they work in the city. If you like my FB page you can message me there with what you are thinking of! Looks like fun! Thanks, too, for visiting my blog. awesome, so I guess Palm Springs, California is slightly out of your area? We havent been to Palm Springs yet but it sounds like a ‘Cake Stories’ sort of place, waiting by the phone for that order!!!! I am interested in a children’s party for my daughter’s 7th birthday. Hi Leanne, many thanks for your interest in a Cake Stories cupcake Party. Have you got an email address that I can send an info attachment to for you? Which date are you looking at and whereabouts are you located? Also, there are extensive photos of different parties if you hop over to our facebook page Cake Stories by Lauren under the photos tab. Look forward to hearing from you with an email address or alternatively you can call on 07977 747059.
that truly seems like fun! Every Party is great fun for all !!!! hi! please can you give me details for children’s birthday parties? my daughter will be turning 5 on april 15th. so i was looking to have a party on 15th in the evening. Hi there will contact you tomorrow – will discuss if the date is flexible. Thanks for the enquiry. hi. didnt receive your call. im looking for a party on 15th april only. ill text you my phone number. can you call me pls. Hi – Have just called – message left! I agree with Psychologistmimi, this looks great fun! I have a joke about cupcakes…there are two cupcakes hanging out in an oven, one says holy s*it it’s hot in here and the other says holy s*it a talking cupcake. Just adorable! I am sure your cakes are great also! My daughter is actually having a party similar this weekend! It’s more of a Strawberry Shortcake cake decorating party. The kids seems like they had A LOT OF FUN mixing up their dough! Yes they love the mxing the Buttercream part !!! Hope your daughters party goes well !